Starsky Robotics is the second self-driving truck startup to come out of the woodwork in less than one week, but it’s approach is unlike any self-driving truck we’ve seen to date. Ghost Robotics’ Minitaur quadruped robot goes for a walk. For more details, we spoke with Kenneally and De, along with Ghost Robotics CEO Jiren Parikh. IEEE Spectrum: How does a legged robot like Minitaur compare to robots with wheels or tracks? Ghost Robotics: On flat surfaces with no objects in their path, wheeled robots are more efficient than tracked, legged and even aerial robots. In sand, mud and rougher terrain, tracks are superior to wheels. However, with fixed objects, obstacles and vertical surfaces in the path of a tracked robot with no alternative path, legged robots are superior. Even if moderate objects and obstacles can be overcome by tracks, continuous unstructured terrain over a large field of operation reduces the energy efficiency of tracked devices when compared to dynamic legged robots. Another advantage is that legged robots typically have a lot more actuated degrees of freedom than similar sized tracked or aerial robots, which can be recruited for tasks like re-orientation, manipulation, and getting the robot unstuck in a much more flexible and versatile way. In scenarios, such as sand and mud flats, tracked devices do well up to the point of getting stuck but they then have limited options for escape, whereas the Minitaur will have greater maneuverability and escape behaviors. Additionally, you would almost certainly need to attach an arm to a wheeled, tracked, or aerial robot to open a door, while we have shown the Minitaur doing this without any modifications to its body. The primary challenge in the adoption of legged robots has been the difficulty of coordinating the many degrees of freedom and balancing on a variety of terrains. Minitaur was designed specifically to allow for very flexible and versatile software control of its limbs at a high bandwidth, which gives the control designer a lot of freedom to design control algorithms which can keep improving as time goes on (without needing to modify the robot body). What’s your experience been like with the durability of Minitaur now that you’re doing dynamic testing outdoors? Considering the Minitaur is still pre-production, we have been subjecting the robot prototype to exhaustive physical experimentation from day one, and it has been quite hard (and fun) to try and damage it in a way that isn’t easily field repairable. Large falls can bend the aluminum legs, but those are easy to either bend back or replace without loss of functionality. The chassis, even in its current design state, has been quite robust and with appropriate protection for the motors, the legs become the primary concern. The direct-drive actuators are inherently robust since there are no gears to break due to impact loading, and we have no hydraulic system or force/torque sensors that can be damaged. One of the core design principles of Minitaur is its reduced mechanical complexity when compared to other legged robots and tracked devices. Tracks look simple, but require complex suspension mechanisms which would be hard to repair on the fly. With regards to mobility, if a tread or suspension mechanism gets damaged on a tracked robot it is only able to travel in circles, but if one of Minitaur’s legs are bent, or a leg is immobilized, it can continue to limp away. Can you describe how Minitaur changes its gait to adapt reactively to different types of terrain? A very basic example is that the walk gait is designed to use feedback to react to perturbations (like the toes slipping on ice, or the uneven nature of walking on a rock bed). If you closely examine the video of Minitaur walking on ice, you can see that the legs recirculate and move much faster when they start slipping, always swinging and repositioning under the body to prevent the body from falling on the ground. A conventional way to design multi-legged walking has been to use a fixed “clock” signal that moves the legs at a fixed frequency (often along a fixed trajectory). Obviously when the legs start slipping and sliding, with a rigid locomotion architecture, it would be very challenging (if not impossible) to keep the legs under the body without feedback from the legs and environment. Your videos show Minitaur using lots of creative ways of moving across varied terrain. What kinds of multi-modal locomotion are you working on? We’ve already shown fence climbing with toe attachments in our first video, and intend to demonstrate other climbing behaviors in future videos using fixed leg attachments that will support climbing various vertical surfaces. Depending on the use case, we expect to have a future design where leg attachments can be interchanged in the field. We are also working on modifications with a confidential customer to repurpose Minitaur to operate as a surface and sub-surface swimmer, and submersible platform that would operate on a seafloor or riverbed using flipper legs. If you look at Minitaur with the legs retracted, you can see how we can make a water-sealed design with sponsons for stability and air bladder to control buoyancy without much effort. Our robot is relatively quiet (no gearbox operating noise) which makes it useful in a variety of scientific and military applications, and has very high specific power (which is one of the limiting resources for underwater vehicles). How far can Minitaur walk on two legs? Is there potential for it to manipulate with the other two legs while balancing? The bipedal walking is a work-in-progress and one of the more challenging behaviors we’re working on— we don’t think there’s currently another 3D biped in the world that uses only 4 actuators. However, we’ve been quite pleased with the progress we’ve made. Minitaur can take up to 20 steps and then drop down onto 4 legs when it knows it can no longer maintain its biped state. We’re continuing our research and intend to have it operate in a bipedal state for much longer. Utilizing 1 or 2 of the legs for various tasks is critical behavior for the Minitaur that we are researching (for example door opening). Bipedal use cases include object manipulation, positioning the robot for climbing a vertical surface, gaining a vantage point for a sensor reading, escape maneuvers and bracing/flailing to aid balance. How well does Minitaur scale upwards to medium sized (or larger) legged robots? We’re pushing up against fundamental limits of torque density with the commercially available electric motors we currently use. The selected motors are critical in keeping the machine at a price point that will be on par with and even below existing tracked devices, and at a much lower cost than other legged robots. With the current motor technology, we can’t build a direct-drive machine as agile as Minitaur at a length-scale much larger than Minitaur’s 40-centimeter length. We can make a heavier version at the same scale that would have better payload capability, but we’d have to make sacrifices to increase the length scale. We are also considering modified /custom motor designs in the future for specific use-cases where cost is less of an issue. Having said that, we have design efforts underway that will allow us to scale Minitaur down and deliver the same functionality with a smaller chassis and payload capacity for specific use cases where a smaller form factor is necessary. Stay tuned on this front. Don’t worry, Ghost Robotics. We’ll be staying tuned. Oh, and just a friendly reminder that Minitaur is really, really relatively cheap, at just around $10k for one, and that’s the hand-built not-in-volume price. Ghost Robotics is working on moving Minitaur from a development platform mostly for researchers towards a commercial version, which could also include more sensors, manipulation capabilities, improved robustness, and some built-in autonomy. The fact that they’re looking to both scale the robot down a bit while actively working to decrease the cost makes me optimistic that at some point, Ghost Robotics might have a mini-Minitaur that would be accessible to hobbyists like myself. Because if I haven’t yet made it abundantly clear, I love this thing and desperately want one. Boston Dynamics has officially unveiled Handle, a research robot that combines the efficiency of wheels with the versatility of legs. 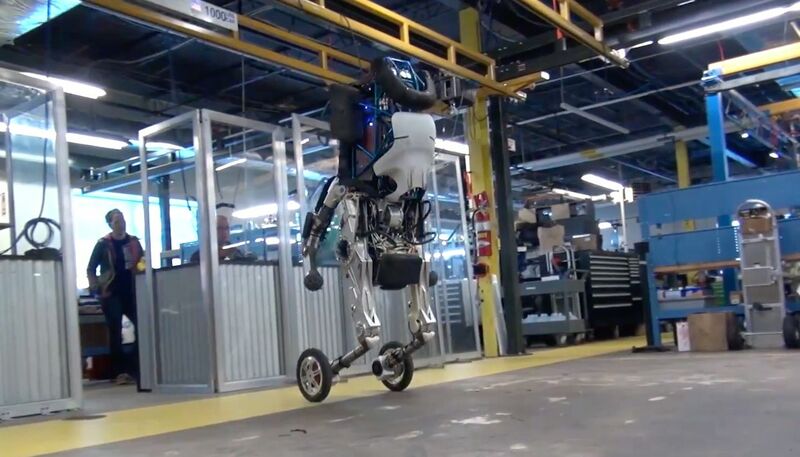 Boston Dynamics’ Handle is a humanoid robot on wheels, and it’s amazing. When Boston Dynamics introduced its massively upgraded Atlas last year, we said the robot could “do things we’ve never seen other robots doing before, making it one of the most advanced humanoids in existence.” But now, after seeing the video that Boston Dynamics just released to officially unveil its newest creation, Handle, a sort of Atlas on wheels, we’ll just say it again: Handle can do things we’ve never seen other robots doing before, making it one of the most advanced humanoids in existence. ’t ready to discuss the new robot and suggested that we wait. Now, finally, we have more details about Handle, and Raibert even answered a few of our questions on why and how they built the robot. Boston Dynamics says Handle is an “R&D robot,” so although it can perform a number of useful tasks, like carrying 45-kilogram crates, it probably won’t be commercially available anytime soon. Handle has a range of 24 kilometers on a battery charge, which is much more than what it would be able to cover with only bipedal locomotion. Using wheels also helps reduce the number of degrees of freedom, and the company says Handle is “significantly less complex” than its previous quadruped and biped robots. Indeed, this kind of multi-modal locomotion is highly effective. In a much more limited capacity, it’s what helped DRC-HUBO win the DARPA Robotics Challenge Finals: Being able to use both wheels and legs helps your robot efficiently adapt to different situations, trading the ability to traverse rough terrain for speed (and stability, which legged robots can have trouble with) and back again whenever necessary, just like you would as a human with a pair of rollerblades. IEEE Spectrum: How did the idea to build a wheeled robot come about, and how long did it take to build it? Were you able to reuse or adapt any of the bioinspired control strategies you’ve used so successfully in legged robots? Much of the control used in Handle leverages our team’s experience with the quadruped and biped robots. The software is not exactly the same, but the balance and dynamic control principles have a lot in common and share the same physics-based roots. Is Handle’s upper body an Atlas torso, or a completely new design? And is the robot all electric or does it use hydraulics? Yes, it uses Atlas’ torso and a slightly modified version of Atlas’ arms. [For power we use] electric power (batteries), but both electric and hydraulic actuation. How do you and your team feel about working with wheels after working on legged designs for so long? Wheels are a great invention. But wheels work best on flat surfaces and legs can go anywhere. By combining wheels and legs, Handle can have the best of both worlds. Watch a Tesla Model S with Autopilot 2.0 engaged repeatedly fail to stay in its lane on a windy road. The incident serves as a good remember that Autopilot users always need to keep their hands on the wheel. Watch this DIY toast-buttering robot, which was built from junk motors, laser cut wood, and zip ties, try to finish making breakfast. Taxing Robots: Will it Help or Hurt Jobs? There’s a real lack of solutions to preventing the seismic shift robots will have on the economy. We examine two potential options: Universal Basic Income and a tax on robots.